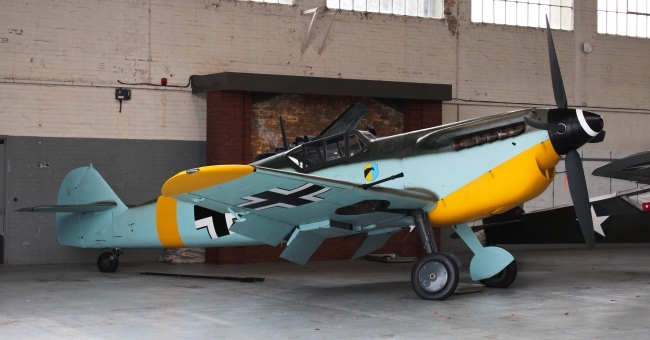 The Buchon was a Spanish built version of the German Messerschmitt Bf 109 fighter but was powered by either a Hispano Suiza or Rolls-Royce engine. 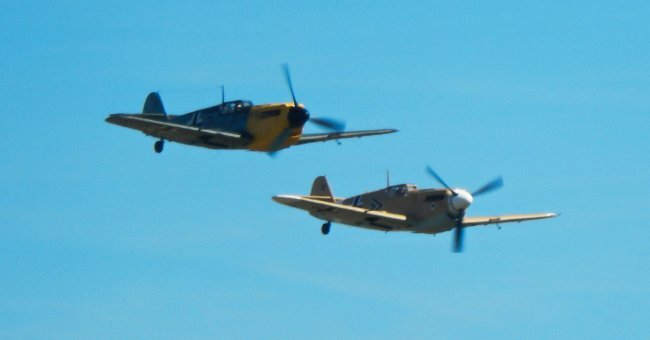 Serving with the Spanish Air Force until the 1960s over 200 Hispano Buchon aircraft would be produced including a few trainers. 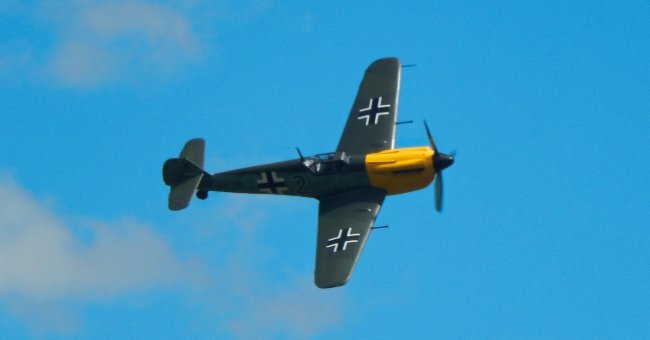 After the Spanish Civil War (July 1936 – April 1939) and the victory by General Francisco Franco 40 Messerschmitt Bf 109 B & Es were left behind by the German Luftwaffe's Condor Legion, which had provided support to Franco's forces, so they could be used by the Spanish Air Force. 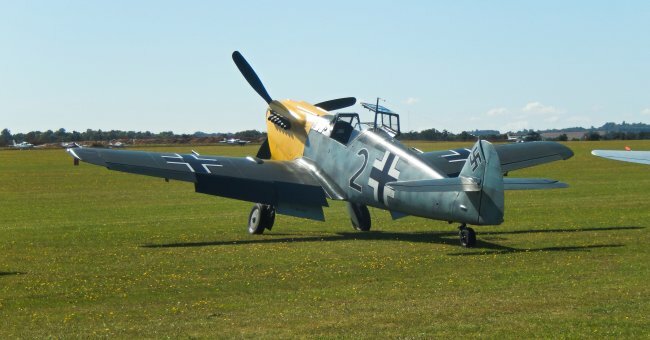 This was followed up in 1943 when an agreement was reached between Messerschmitt and the Spanish Government for 200 BF 109G-2s to be licence built in Spain and known as BF 109Js and powered by the Daimler-Benz DB 605. This would see 25 dismantled examples sent so that they could be used as patten aircraft by manufactures in Spain. However by 1943/44 the tide of the war was going against Germany so when the aircraft arrived in Spain they were minus their engines, propellers, armament and tail fins. To compound the issue the jigs and technical drawings were also unforthcoming. So as 1944 came to a close and with no sign of the much needed parts to complete the airframes Hispano Aviacion would change the aircraft in 1945 so that the Hispano Suiza 127-89 engine could be used and these were known as the HA-1109-J1L but the engine was replaced by the 127-17 and a new designation of K1L was given to the aircraft. 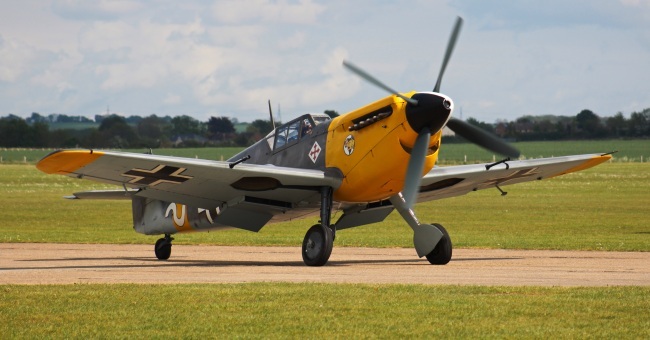 It wouldn't be until the 1950s when the definitive version of the Buchon, originally given the designation HA-1109-M1L, would be built when a 1,600-hp Rolls-Royce Merlin 500-45 was installed, giving the aircraft a top speed of 419 mph, and as a result gave the Buchon a distinctive chain compared to its Bf 109 predecessor. Armament would consist of a pair of 20mm Hispano Suiza cannons and eight 80mm rockets and this flew for the first time on the 24th March 1954 and when this type entered service two years later it was known as the HA-1112-M1L Buchon. 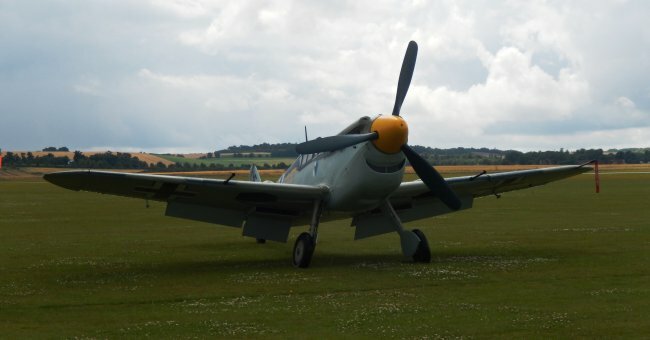 The Buchon would stay in service until 1965, with the last one retired on the 27th December, and would be used by the Spanish Air Force in Morocco and over the Sahara. In total 239 were built including a handful of two-seater trainers. 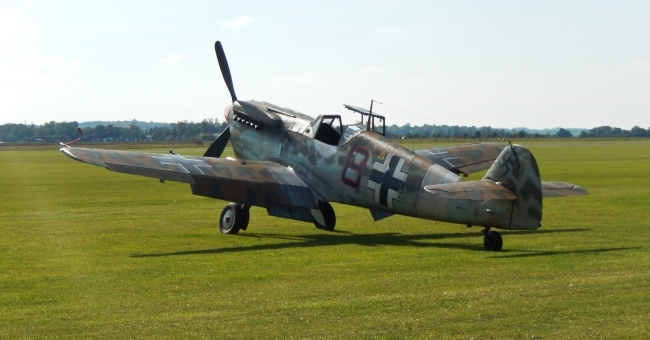 HA-1109-J1L 25 Messerschmitt BF 109 G-2s from Germany powered by the Hispano Suiza 127-89 engine. HA-1109-K1L Coverted J1Ls but powered by the Hispano Suiza 127-17 engine. HA-1110-K1L Sole two-seater trainer powered by an Hispano engine. HA-1110-M1L Projected two-seater trainer which would have a Rolls-Royce Merlin. HA-1111-K1L Project that saw wingtip mounted fuel tanks added to a two-seater trainer. HA-1111-M4L Two-seater trainer powered by a Rolls-Royce Merlin. One built and the HA-1110-K1L was converted to this standard.